Growing up in a small and sleepy town in the Philippines, I remember hearing the local street vendors calling out thus was enough to get me scrambling out of bed even in the early morning. 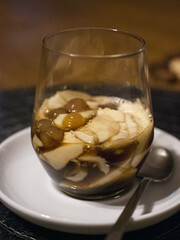 Yup, taho—a pudding made out of very soft, silky tofu with sago (tapioca) pearls drizzled with arnibal (brown sugar syrup)—has always been one of my favourite (early morning) snacks. Thankfully, there is the internet… and Pinterest 😋 I found several very easy recipes that only required using commercially bought silky tofu and making your own arnibal. I tried them and, although they were okay, they were not exactly the same as the ones back in the Philippines—the tofu is a bit firmer in texture and it had a savoury aftertaste reminiscent of the tofu you use as a meat substitute. So, it was back to the drawing board and this time, I realised I should look for recipes on how to make my own silky tofu. 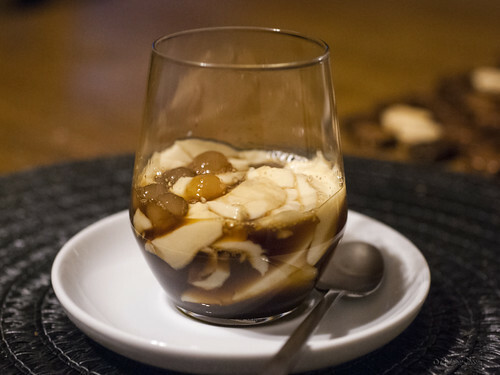 I found several recipes for making silky tofu using different coagulants: food grade gypsum (calcium sulfate), food grade Epsom salt (magnesium sulfate), nigari (magnesium chloride), and agar-agar. I’m sharing the recipe using agar-agar mainly because all the other coagulants are not as easy to get a hold of here (I had to order the food grade gypsum at Amazon and it will be arriving sometime between 6 November and 26 November; the Epsom salt is available in limited stocks at one of the health stores here, but I won’t be able to check until at least tomorrow at the earliest). 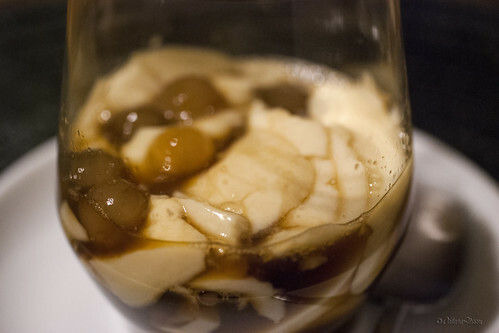 NOTE: since the recipe used only agar-agar, the resulting tofu could only be eaten cold. Heating the tofu in the microwave, even at the half power for 20 seconds, would melt it—I tried. Divide the soy milk into two equal portions. Pour one portion into a saucepan along with the vanilla extract (if using) and heat up over low heat. 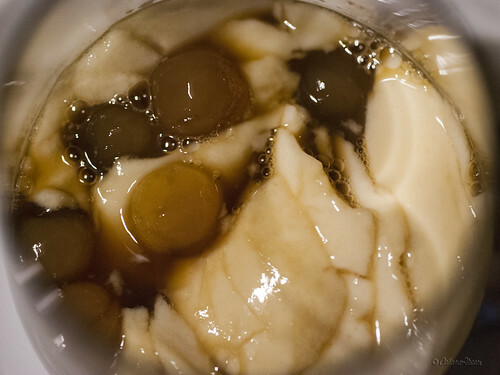 Dissolve the agar-agar in the remaining portion of soy milk. When the soy milk in the saucepan gets hot, slowly pour in the soy milk-agar-agar mixture. Stir to combine/mix well. Let the mixture cook over low to medium heat for 5-8 minutes, stirring occasionally. Turn the heat off when you see bubbles forming on top. Do not let boil. Pour the hot soy milk into bowls/ramekins. Skim off the bubbles on top. Allow to cool for about 15 minutes. Skim off a thin layer of tofu curd on top. Chill in the refrigerator for 4 hours or just leave at room temperature until set (will take longer). Pour 2 cups of water into a cooking pot. Bring to a boil. Pour the tapioca pearls into the boiling water. Let simmer for 30 minutes over medium heat, stirring occasionally. Transfer to an airtight container, keeping only enough of the water they boiled in just to cover the sago pearls. Season with 1-2 tablespoons brown sugar. Store in the refrigerator for up to a week. * The sago is ready when they are translucent with only a small dot in the center. If they are not ready yet after one hour, repeat the cooking procedure (no need to use fresh water; just drain the sago and use the sago-water, topping up with enough new water just to keep the sago pearls submerged). Combine all ingredients in a saucepan. Bring to a boil, then simmer over medium heat until syrupy in consistency. Set aside. Scrape off thin strips of the tofu into a glass. 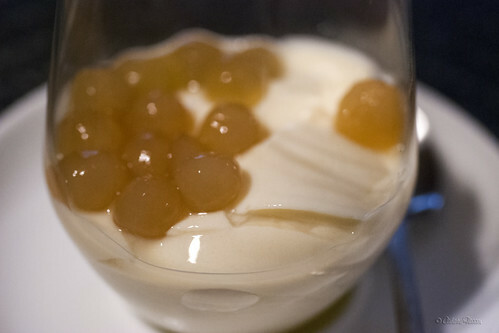 Top with desired amount of sago pearls and arnibal.